Jefferson Elementary Counselor Emily Polk believes that the most powerful tool we all possess is our ability to connect and develop relationships with students. 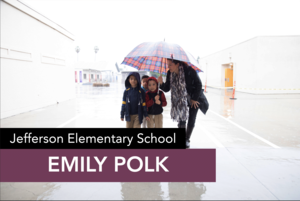 “By forming connected relationships with caring adults, students are able to grow, heal, and maximize their potential as lifelong learners,” Emily says. Because of this belief, Emily founded the Juntos Wellness Center in 2012 with a vision of strengthening opportunities for students to get the social-emotional support they need and deserve. Just for fun: On rainy days, everything and anything can happen! Pictured here is Emily guiding students to their classrooms after they had lunch. With the rain coming down so hard, she makes sure to bring a large umbrella to help keep the students dry. Thank you, Emily, for all that you do!